What should you go for, Poco F1's dirt cheap price or OnePlus 6T's premium features? The Poco F1 has an unbeatable value for money and great features which were never seen at this price while the OnePlus 6T brings in all the modern features like the in-display fingerprint scanner and has a perfect balance of all the meaningful features at the price everybody could afford. Both the Poco F1 and the OnePlus 6T carry flagship experiences and are great at their own spaces but there are few things which vastly differentiate the two. The Poco F1 has got the flagship processor, good cameras, a big battery and a lot more but it takes a hit in terms of its polycarbonate design, a big notch but these are absolutely fine for its price. The OnePlus 6T, on the other hand, is a lot more premium, beautiful and a more polished phone overall. We can go on to the extent of saying that the OnePlus 6T is pretty close in delivering a great flagship phone experience like the Apple iPhone XS, which is the most premium phone out there with the best in class user experience. 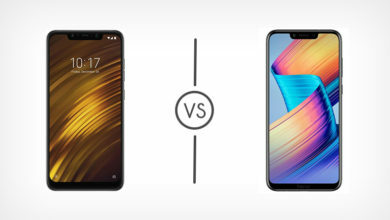 So, the math is simple, if you are really stuck with the budget, go with the Poco F1 but, if you have any chance to get the OnePlus 6T, you should really take a lot of efforts for it!